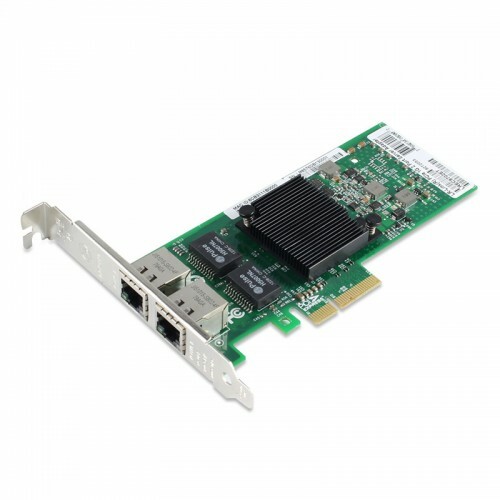 The NIC-9702ET Multi-Port Server Adapter is PCIe GbE network adapters. Built with the Intel 82576 Gigabit Ethernet Controller, these new adapters showcase the next evolution in GbE networking features for the enterprise network and data center. These features include support for multi-core processors and optimization for server virtualization. VMDq reduces I/O overhead created by the hypervisor in a virtualized server by performing data sorting and coalescing in the network silicon. 2 VMDq technology makes use of multiple queues in the network controller. As data packets enter the network adapter, they are sorted, and packets traveling to the same destination (or virtual machine) get grouped together in a single queue. The packets are then sent to the hypervisor, which directs them to their respective virtual machines. Relieving the hypervisor of packet filtering and sorting improves overall CPU usage and throughput levels. These dual-port adapter provide high-performing, multi-port Gigabit connectivity in a multi-core platform as well as in a virtualized environment. In a multi-core platform, the adapters support different technologies such as multiple queues, receive-side scaling, MSI-X, and Low Latency Interrupts, that help in accelerating the data across the platform, thereby improving application response times. NIC-9702ET PCIe Gigabit adapter provides improved performance with the next-generation VMDq technology, which includes features such as loop back functionality for inter-VM communication, priority-weighted bandwidth management, and doubling the number of data queues per port from four to eight. It now also supports multicast and broadcast data on a virtualized server. in load-balancing I/O interrupts across multiple processor cores, and Low Latency Interrupts can provide certain data streams a non-modulated path directly to the application. RSS directs the interrupts to a specific processor core based on the applications address. For mission-critical applications, where dedicated I/O is required for maximum network performance, users can assign a dedicated virtual function port to a VM. The controller provides direct VM connectivity and data protection across VMs using SR-IOV. SR-IOV technology enables the data to bypass the software virtual switch and provides near-native performance. It assigns either physical or virtual I/O ports to individual VMs directly. This technology is best suited for applications that demand the highest I/O throughput and lowest-latency performance such as database, storage, and financial applications. The PCI-SIG SR-IOV capability is a mechanism for devices to advertise their ability to be directly assigned to multiple virtual machines. This technology enables the partitioning of a PCI function into many virtual interfaces for the purpose of sharing the resources of a PCI Express- (PCIe) device in a virtual environment. These virtual interfaces are called Virtual Functions. Each virtual function can support a unique and separate data path for I/O- related functions within the PCI Express hierarchy. Use of SR-IOV with a networking device, for example, allows the bandwidth of a single port (function) to be partitioned into smaller slices that may be allocated to specific VMs, or guests, via a standard interface. The NIC-9702ET Multi-Port Server Adapter is PCIe adapters to provide authentication and encryption for IPsec and LinkSec. LinkSec is already designed into the network adapter hardware. These adapters are future-proof and prepared to provide LinkSec functionality when the ecosystem supports this new technology.